The country took a well-deserved time-out last night from bleak news about jobs, deficits, health care, Iran and the like. Even if you were pulling for Peyton Manning and the Colts, you had to agree that the epic upset victory by the New Orleans Saints was the best feel-good moment for the country in more than a year. Drew Brees and the Saints did more than deliver a storybook ending to a storybook year. They made New Orleans a fresh symbol of the American spirit – what we can do as a people when we have our backs to the wall and join together in search of a comeback. As almost everyone knows by now, Drew Brees is himself a story of overcoming the odds. Even though he was a high school star, most colleges weren’t interested in him as a player because he was so short – six feet in cleats, far below today’s stereotype. By grit and determination, he made it into the pros but four years ago, diving on a fumble, injured his shoulder so badly that no one wanted him except for the Saints, a team with such a sorry record that it was often nicknamed the “Aints” back home. 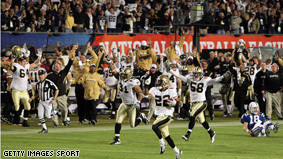 Brees bonded with the team and became a fierce believer in New Orleans, especially after Katrina. He and his teammates have long made a Super Bowl victory – their first ever – a goal that would show both they and their city are champions. They certainly proved that last night, beating not only one of the best quarterbacks ever in Manning but proving they were a complete team with a gutsy coach. This moment brings renewed national attention to a city that is now showing major sparks of life. Certainly the poverty and corruption have not disappeared; the poor neighborhoods still look devastated. But scores of young Americans have swept into the city to lend helping hands, rebuilding house by house, block by block. The spirit of volunteerism is powerful. So, too, is the spirit of school reform: the flowering of charter schools and the coming of Paul Vallas as School Superintendent have both been major steps forward. And just in the past few days, the voters of New Orleans – white and black together – have elected a superb new mayor, Mitch Landrieu. Those who have known him as lieutenant governor of the state recognize that he is a strong, inspirational leader who has the potential to become the best mayor in decades. New Orleans is not back yet, and the crown may not sit long on the temple of the Saints - one can already see Peyton Manning plotting out next year. But isn’t this a moment to savor? Isn’t this a time to remind ourselves that if New Orleans and the Saints can rally together to get up off their backs and stand tall, so can America itself? As a native New Yorker and Giants' fan, I was so rooting for the Saints to win. Who wasn't? Congratulations to the Saints, their wonderful fans and the great city of New Orleans. I laughed this morning while walking to work when I saw hanging from a brownstone on East 83rd Street in Manhattan a giant Saints flag. David, you are so right! If New Orleans can stage this great comeback, so can the rest of America. The saints did an amazing job, they proved to new orleans that we really could do it, i live in new orleans and i truly believed in then they gave heart and soul into that game and they made new orleans history!!!!!!!!! we are so very proud of our boys!!! we were to call the saints a part of new orleans!!!!!! On a whim we made the short trip from Baton Rouge to the French Quarter two weeks ago to watch the Saints play the Vikings, and I wish that everyone could experience the overwhelming elation that was flowing like electricity after that win on the streets of the Quarter. Complete strangers, every size, shape and color, were hugging and crying and laughing together. It was phenomenal, and I know that last night, those lucky folks in the Quarter got to do it all over again. The Saints have brought us all together and have made us so proud. Thank you! I'm crying as I read this piece. Thank you, David Gergen. I always want to hear what you have to say on any subject. I'm from Mississippi. New Orleans is very dear to us and our own Gulf Coast took a beating from Katrina that has still not healed. Last night was something to CELEBRATE for the entire region. I tried to explain our family's support of the Saints for the past 30 years to someone and finally I said, "Hey. They are family. And no matter how good or how bad they play, we love our family." They represent so much more to us than a football franchise. WE DAT!! Over the past 30 years my husband and I have visited New Orleans many, many times. We love that city like it was our own home. We were devestated at the effect of Katrina but the Saints and the people of New Orleans have the right stuff! Heart won the game and heart and shoulder to the wheel will bring the city back to it's glory again. Hey, my hat's off to the Saints. I am incredibly happy for them! However, do you think by any chance the game was "thrown"? At one point, the camera was on Peyton as he sat out of the game. There was an "under-eyed, ravenous" look steming from his face. I've never seen that look on Peyton before. What was that? NO, like a lot of industrial cities of America, are gritty, tough places that have survived many bad times. To visit NO and experience the pride and determination of its people is something that other cities need to take a lesson from. The citizens of NO were given a boost by a team that was determined to bring hope and respectibility back to a people that have suffered for the past 4 years. I live in Louisiana, and can i say WHO DAT?!?! It feels so good: feeling good again. Thanks mr. cooper, it really felt the whole nation was behind us last night. We, the Who Dat Nation,respect and agree with your intelligent opinion. If you ever come down to New Orleans,I'll be more than glad to show you our humble hospitality. surely. AND Drew Brees, what a guy! He has suffered in many ways since his early years but he's the right quarterback for the right team and the right city. Everyone loves him and he's to be King Bacchus at Mardi Gras this year. A fitting ending for this great Super Bowl win. This team has been in existence for 44 yrs. thanks to Mr. Tom Benson who never gave up on them and now with such a wonderful coach in Sean Payton, and the Saints Team, New Orleans as well as the whole state is looking forward to a big come back for the city. New Orleans unlike many cities, has the chance to be reborn at this moment. So much going well for them...here's hoping the people of New Orleans can ride this high and do great things. Thank you for bringing to words the emotions and feelings of everyone in this region. By God's Grace, the Saints Are Alive! Thank you for your article. My plan was to go to Bourbon Street to watch the game with my fellow WHO DATS, but then decided to watch it all alone surrounded by memories of my parents and other family members who gathered around the TV beginning in 1967 to cheer our guys in black and gold each week. We love our Saints here but our Saints in heaven are savoring the victory just as much. Words from a wise brother. They all play with heart Jennifer O..Any team can beat another team on any given Sunday..
Nice sentiment David! You haven't lost your touch either! I had been thinking Peyton had developed an new art form the way he sizes up the field from the line of scrimage. Well I was wrong! It is the entire Saints organization who gave us football lessons last night. Drew could well be running for office the way his can hold up his baby too! Good for you Drew. I was sad to learn that cadillac did not give Drew Brees a car choice this year. For someone who has done so much for a city and given so selfless of himself this ishould be insulting to all red-blooded Americans. Cadillace claimed that they cut back after their so called "bailout" by the government. Since we the people of america i.e. the government have already paid for this vehicle, we the people think that Mr. Brees should have gotten his cadillac. Geaux Saints. As a native New Orleanian who left after Katrina and longs to be back every day, this win says something about the determination of the New Orleans people. It was a great game but more than that it was evidence of a unity that is in the city and Mitch Landrieu's father was my mayor so I know he will have good advice. His is from an old New Orleans family with strong ties to this city.He is not a newcomer who thinks like an outsider. This is a new day for a New Orleans that has lived through some bad days. This is America's "antique" city with so much historical culture and music and art that it needs to be preserved like the fine antique it is. "Who Dat? "Dat "is my city, broken and repaired, flooded with water but also flooded with determination and unity. Long live the Saints and New Orleans. Thanks for the insight on the promise of the entire city of N.O. the Saints have certainly been a unifier and hopefully the elected officials can take that headstart to forge a more cohesive populus. As for the NUN prognositcator on the Sunday news. the pot shot at the President was ugly and your prediction was WRONG alway bet on Black & GOLD Who Dat!!! Thank You for everthing you do Anderson. I'm in New Orleans, still in shock, but enjoying every minute. I can't wait for the Saints Pararde Tuesday night. New Orleans an inspiration? A city that won't leave when told, a city that sits around with their hand out waiting for taxpayers to do everything for them, an inspiration? Well i guess we are becoing a country of entitlement so I guess they inspire that. I wish they would stop the ghetto "Who dat". If this was the best feel-good moment for this country in a year, we have a pretty low bar. Sorry, but, running around "yellin'" "Who Dat?" isn't my idea of a high point. Please don't take me for a Colts fan. Didn't watch the Super Bowl so I didn't have a "dog in the hunt". There's just something tawdry about watching drunks screaming "Who Dat?" I like to think that even my daily life just taking out the trash is more interesting than that. now-Sen. Scott Brown when Gergen referred to the "Kennedy seat" in the Mass. senatorial race. hyped, crassly commercial football game and the really deep-seated problems the country faces. I am not a football fan but I became one for only one game when I read the Saint's and the Drew Bress story. I really wanted them to win, I kept track of the score at the beginning and thought they probably wouldn't make it, when later I found out they won, my heart did flip flops. I just loved the David Gergan editorial and I agree that this win was a much needed feel good moment for this country, never give up and the SAINTS will certainly come marching through, 3 big cheers for New Orleans and their hero coach and especially for Drew Bress !!!. Very, very well said – whew! Obama himself was rooting for them. Thank you Mr. Gergen. We have waited so long for this. Many of us in the Who Dat Nationl remain speechless on this All Saints Day. You said if for us quite nicely. Nice column, great perspective. I like it. Let's hope it is the truth. Come on America. I BELIEVE! Saints and Drew Brees played with heart. Unfortunated Manning did not. And as good as he is that is what was missing. With professional sports these days being so much about money, etc. Having heart is still a deciding factor!! YEAH! Yet, the Saints did not have the federal or state government as a road blocks to success in standing tall. Can we defeat what is the opposition for our elected leadership for ownership of the crown, that remains to be seen. Yet it does appear that a comback is on the way, from mainstreet up in what will be a historic upset for the "Aints." We are by hometeam, Americans first, and we "aint' gonna sit on the sidelines any longer. If I'm not mistaken, I don't think Indy even covered the point spread. Too bad I'm not a betting girl! For a year when my Eagles and none of my favorite teams were playing, this was the happiest and most exciting superbowl game I have ever had. I was praying for this outcome, and I hope that New Orleans has a speedy economic, housing, and prosperous recovery form the hurricanes.